Valerian and the City of a Thousand Planets New Images Revealed | Nerd Much? Coming exclusively from GamesRadar are a few images from the upcoming film Valerian and the City of a Thousand Planets. The most interesting is of Bob the pirate, named by director Luc Besson. Honestly, I can’t even tell what is a prosthetic here and what isn’t. Though we shouldn’t probably keep in mind that stills and photographs like this can be easily doctored to look better than the film version will. Bob the pirate looks somewhere between steampunk and cyberpunk, with a nearly seamless metal-looking ear, two very different eyes (though I know where to get both such contact lenses, so that much I can say is probably real), a mechanical whats-it attached to his forehead, what arms and neck that hints at an entirely robotic body. Oh, and one strand of blue hair, to enhance the blue filter on everything I suppose. Seriously, why is there so much blue in all these images and the trailers? Does it make CGI look better? 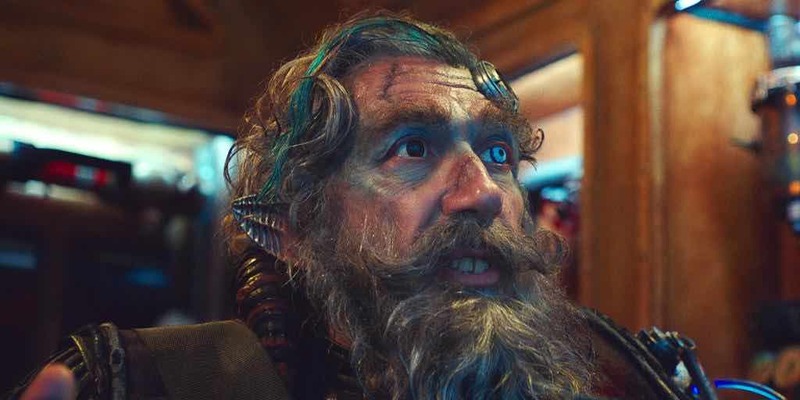 There is no word yet on what exactly Alain Chabat’s role as Bob the pirate actually entails, but we’ll find out soon on July 21 when the film comes out. The other images are of alien races we’ve seen before, including the slim and mysterious aliens that appear very beautiful and peaceful in both the trailers and this image. These are more clearly CGI, with their slightly too smooth skin and clearly animated jewelry. If you’re ever in doubt if something is real or CGI, it’s the textures you’ve got to look at. CGI is art, and art has a way of overemphasizing details we normally don’t see, like wrinkles or the hair on our skin. Valerian and the City of a Thousand Planets stars Dane DeHaan as Valerian and Cara Delevingne as Laureline, both playing special operatives that must save the planet Alpha to which the title of the film refers to. By saving Alpha, the pair will also be saving the universe, as protagonists are wont to do.